Whether it's received with dismay or enthusiasm, As I Lay Dying's fifth outing The Powerless Rise arrives to prove metalcore is still a viable genre. Having had his fun on those Arnold Schwarzenegger-inspired total brutal albums, Tim Lambesis rejoins his buddies to feed the world the same aural dish they've been peddling since forever. Expect brutal thrash tempos, melodies 'borrowed' from either At The Gates or In Flames, harsh vocals often accompanied by (annoying) saccharine croons, and the occasional guitar solo as proof these guys haven't abandoned their heavy metal roots. This time around, the band's 'Christian' bent is rather vague amidst the formulaic chaos. Who cares, anyway? The Powerless Rise gets off to a humdrum start with the predictably aggressive Beyond Our Suffering. Oh sure, the riffs are a-cracklin', Jordan Mancino's drumming could register on the Richter scale, and Tim's vocals are furious. But let's be honest here, the opening salvo launching the album can alternately be heard from any of the band's peers, from Trivium to Bullet for My Valentine or All That Remains and even the originators themselves, Killswitch Engage. Anodyne Sea is a marked improvement because of the drama the quintet showcase at the chorus. It's a fun track whose verve uplifts your enthusiasm for the songs to come. Having dished out by-the-numbers metalcore and then gone down the catchier route, As I Lay Dying jump aboard the death metal wagon for Without Conclusion only to have it to pale in the face of the energetic Parallels. By the time half the album has run its course, you're either deeply disturbed or hopeful. The latter feelings are amply rewarded by the forgettable The Plague, which may cause anger and apathy until you realize As I Lay Dying have jinxed themselves to always follow the same blueprint. Always. Sweet relief comes in the form of the album's hardest tune Condemned, which is bound to ignite a circle pit every time it's performed live. The Powerless Rise isn't very interesting on its last stretch, just more of the same, nd if it weren't for the band's expert musicianship and song writing panache, The Powerless Rise would doubtless be a certified snore fest. Yet despite the numerous barbs thrown at them, As I Lay Dying remain very comfortable in their niche. Devoted fans won't miss anything on their latest. 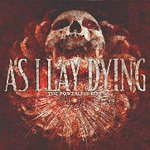 Despite the numerous barbs thrown at them, As I Lay Dying remain very comfortable in their niche. Devoted fans won't miss anything on their latest.